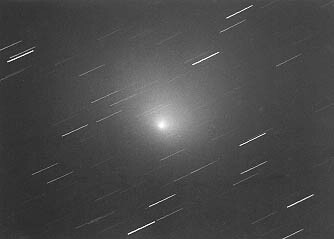 This comet passed us at a distance of only 0.3 AU (4.7 million kilometers) from the earth. There was no visible tail. It appeared as a disk at magnitude 3-4 and passed us at an incredible speed of 30 degrees per day. Tracking it by Geisei's 60cm telescope was very difficult and I had to keep pushing remote control buttons for 10 minutes without any break. Incidentally, Comet LINEAR (C/1999 S4) passed us 10 times more distant when it made the closest approach to the earth on July 26 at its perihelion. Comet IRAS-Araki-Alcock's approach to the earth was the third closest on record among those which came close to the earth. Copyright (C) 2000 Tsutomu Seki.